Two years ago, April 15, 2008 – The Cause for the Beatification and Canonization of Archbishop Fulton J. Sheen officially opened in Rome with a ceremony at the offices of the Vatican Congregation for the Causes of Saints. 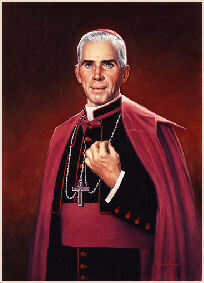 If the congregation makes a declaration that Archbishop Sheen lived a life of heroic virtue, he will be accorded the title venerable. The next step is beatification, after which he would be called blessed. Certification of a miracle attributed to his intercession is required for beatification. I haven’t read much about him, but my favorite quote, so far, is this . . .
Archbishop Fulton Sheen exemplified what it truly means to be a priest; his love for Jesus & deep devotion to the Eucharist is well known. Check out some links to audio (some free), video and books about and by him at Is Anybody There? blog.